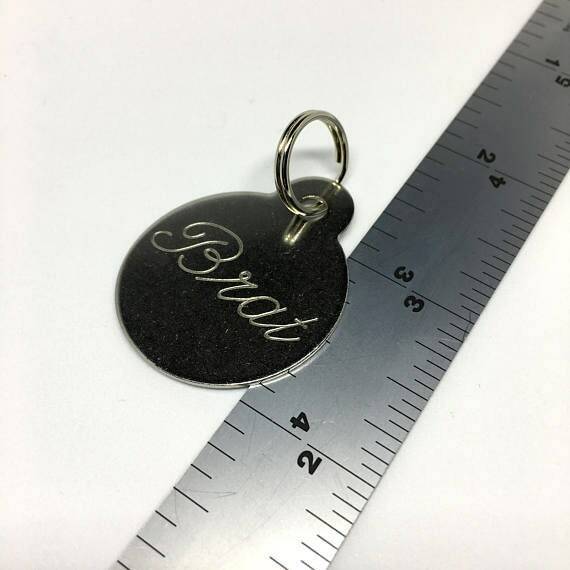 Engraved collar tag with "Little." Made of stainless steel with a small split ring attached. Collar tags are 1 1/2 inches by 1 1/4 inches with a 1/2 inch split ring. THIS LISTING IS FOR THE COLLAR TAG ONLY. You can find a selection of our collars in our store! All of our engraved items are engraved using a rotary engraver. Most items are made order as we keep a low stock of most items. Collar tags are made of stainless steel. All collar tags are engraved in a cursive font. Sans serif font available by request or through the custom listing. Custom orders are totally welcome! I will have a listing available for custom orders shortly for all engraved pieces. There are two fonts currently available. 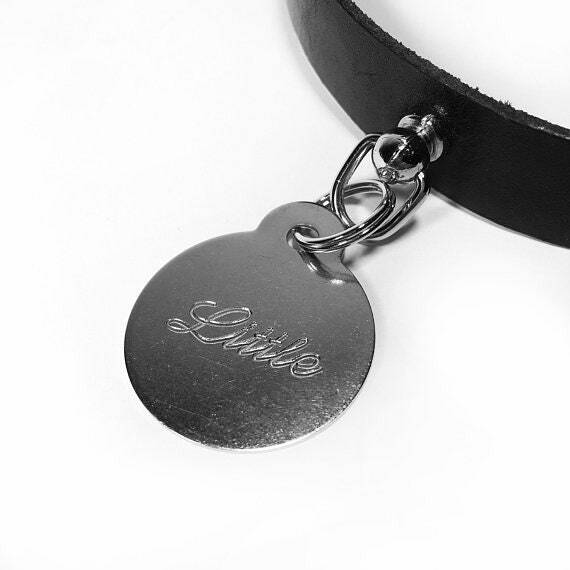 For leather goods, we do offer words stamped into the leather collars. We can also make plain leather collars. Custom sizes are always available. Just make sure to include the size of neck you would like the collar to fit. Can you ship to X country? I definitely can! If your country is not currently listed as having shipping available, send me a message and I will be able to add yours to the list as soon as I find out the shipping costs. I live close! Can you local pick up/delivery? If you live in Toronto and are willing to meet at Runnymede Station, we can definitely arrange a pick up! If you would like to pick up your product, use code LOCALPICKUP at check out and include a few times you would be able to pick up your order. Why do customs cost more? Even though each of the items we make are made to order, we do generally have the leather pieces cut to the two default sizes, holes punched, and have already been treated with the wax finishing coat. We don't assemble them past that until an order comes through, mostly due to them being easier to store in that state. We also sometimes have a few of our standard sizes already made in our stock we bring to shows. For the majority of the engraved pieces, we do currently have stock. Any that are ordered that are not in stock, we generally try and create many of them to restock. Custom pieces we only create one of, so it takes more time having to adjust the letter set and sizing on the machine, as well as testing. Can you rush my order? I need it by X date! If you need your order by a specific date, please message us before placing your order. If your order requires rush shipping, we will have to change the shipping costs, as well as make sure that the piece(s) can be created in time, pending on stock. Yes! They are nickel free! Unfortunately no. For the O and D ring collars we can make them nickel free, but it costs extra as we have to use more expensive pieces. Unfortunately we have yet to find a supplier for the heart rings that make affordable nickel free hearts. As soon as we do have the option for them, it will be made available.